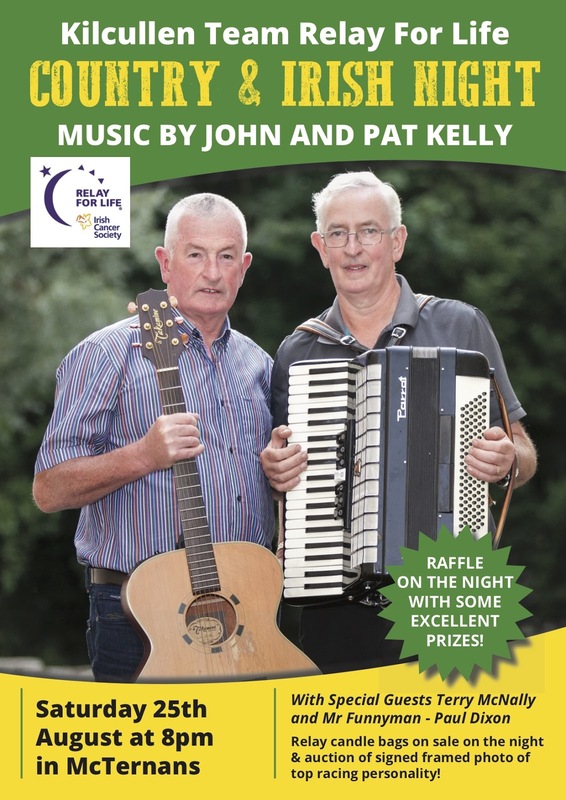 A reminder that Kilcullen Team Relay For Life are holding a Country and Irish night in McTernans on Saturday 25 August as a fundraiser in the run up to the Kildare Relay For Life on 15/16 September, writes Sabina Reddy. Pat and John Kelly will be singing all the favourites so come along and support. There's no cover charge but donations will be appreciated and the Relay For Life Candle Bags will be for sale on the night. Relay For Life is a weekend to celebrate people who have survived cancer, to acknowledge the fight people are going through with treatment, and to hope for a cure. It is a 24-hour fun packed, family friendly, entertaining weekend with the main event being the Candle of Hope ceremony on the Saturday night. Anyone who is going through or has survived cancer and would like to get involved please get in touch with any of us, we have a facebook page Kilcullen Team Relay For Life. Last year, the Kilcullen Relay for Life Team raised €4,210.